You will notice when you give the Double Exposure Blackjack game any amount of play time that the dealer does something very unusual when dealing out the cards. For he will always deal himself two initial cards when dealing out each hand and those two cards are going to be dealt face up. This does of course mean that you can see the value of his hand and base all of your playing and betting decisions on what you can see! There are a total of eight decks of playing cards in play in the shoe of the Double Exposure Blackjack game which are always shuffled before a new game is sent into live play. Once you have made you decision in regards to how you play off your hand the dealer is going to play his hand off and will always hit any soft 17 valued hand or any hand worth lower than a soft 17. Be aware that if you and the dealer have a tied hand which is not a blackjack hand then the dealers hand is deemed to be the winning hand. Should however both yourself and the dealer have a blackjack hand then it is your hand that is deemed to be the winning hand, and the winning payout of even money as described in the following section will be awarded to you when you both you and the dealer end that game with any type of blackjack hand that being any ace and ten valued card. There is a price to be paid in regards to the dealer always dealing out this hand face up when you choose to play the Double Exposure Blackjack game variant, and that is all winning player payouts are even money! So it doesn’t matter if you are dealt out a blackjack hand that being a hand containing an ace and a ten or any other winning hand, if your hand beats the dealer you are paid out at even money and not 3 to 2 if you have a winning blackjack hand! Keep that in mind when you play this game online, just in case you think you have been short changed! The house edge attached to this game when you play it perfectly is 0.69%, be aware in regards to that house edge is it slightly higher than the house edge attached to most other variants on offer online, and as such you may be best off choosing a lower house edge game for an increased winning chance than playing this game! One other aspect to playing the Double Exposure Blackjack game that you need to be aware of is that you are never going to be offered the insurance side bet wager, mainly due to the fact that you will be able to see what hand the dealer has at all times! Due to the fact that you can always see just what two initial cards the dealer has been dealt when you choose to play the Double Exposure Blackjack game online you may be tempted to give it some real money gaming action online, and if that is the case you will need to be aware of the additional game play rules, so let us now let you now show you can play off each hand dealt out to you as per the game play rules. The rules of this blackjack game variant will allow you to double down any initial two cad hand if that hand has a value of a hard 9, 10 or 11. Be aware that the additional wager required for placing a double down bet is the same as you placed on the base game hand and just one card will be dealt out to your hand. You can of course double down if you have chosen to split any hand, and any to cards that have the same value whether for example a pair of 4’s or any two 10 valued cards such as a jack or king can be split. You can split a hand no more than three times and when you have split any pair of aces just one card is going to be dealt out to each ace, and any split hand that contains an ace and a 10 valued card will be paid out as per the base game hand at even money. One thing to note if you do decide to play the Double Exposure Blackjack game is that the strategy required to get the house edge down to the absolute minimum is quite different to the strategy you will have to adopt when playing more other blackjack games online. To help you easily be able to play this game perfectly please make use of the blackjack strategy card you can see displayed on this be page. Surrender – There is no surrender option on offer on this blackjack game, if you are seeking such a game then take a look at the Atlantic City Blackjack game guide as you will be able to take the surrender option on that game. Doubling Down – As you are only able to double down when you have even dealt a hard 9, 10 or 11 when playing this game please refer to our blackjack strategy card for it will let you know when that is the correct playing decision to make when holding such a hand. Hitting a Hand – You should always choose to hit your hand when it has a value of a soft 13 to soft 17, do not be put off making that playing move if the dealer appears to be holding a high valued pair of card! When to Stand – Should you have been dealt out a soft 20 valued hand you should always stand it but not if the dealer is showing a 20 valued hand in which case the best move to make is to hit that soft 20 hand instead. Insurance – You are never going to be offered the insurance wager when playing Double Exposure Black as you can always see the dealer’s cards so you will always know the value of his hand! By playing Double Exposure Blackjack online and for real money you are going to be able to get lots of little extras thanks to the online casino loyalty and comp clubs. 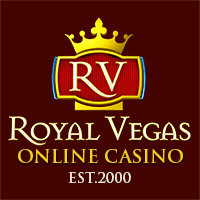 Before you do select an online casino site at which to play give their website a read through to see just how many comp points per wager you will be awarded with and also check out just how generous the redemption rates are for turning your points into real money playing credits, as they will vary from site to site. 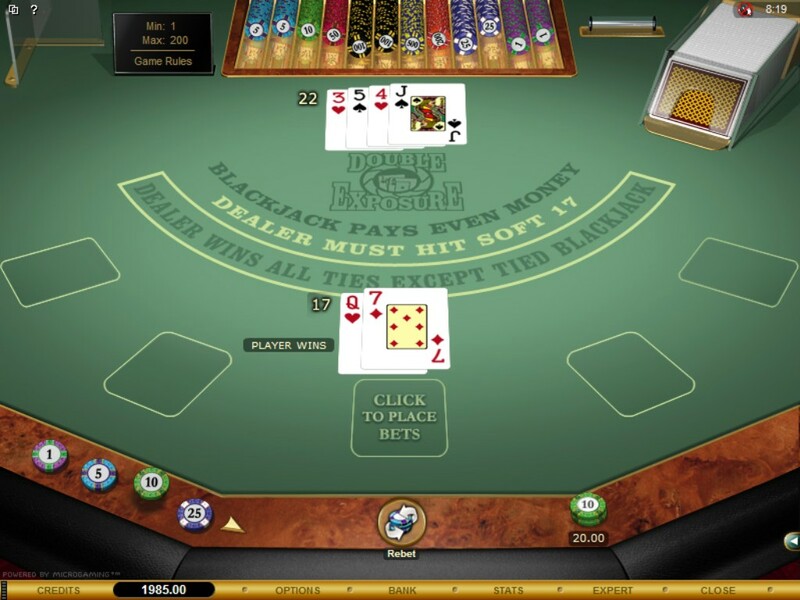 Bonuses given away by some online casinos sites cannot be used on the Double Exposure Blackjack game and those sites that do let you sure their bonuses on this blackjack game variant may force you to play through your bonus funds and deposited amount a much larger number of times when playing this game due to its low house edge, so make sure the bonuses you are claiming come with reasonable play through requirements to ensure you get the maximum playing value.